One thing people always want to know, when you confess you are a travel writer, is where in the world is hot when. 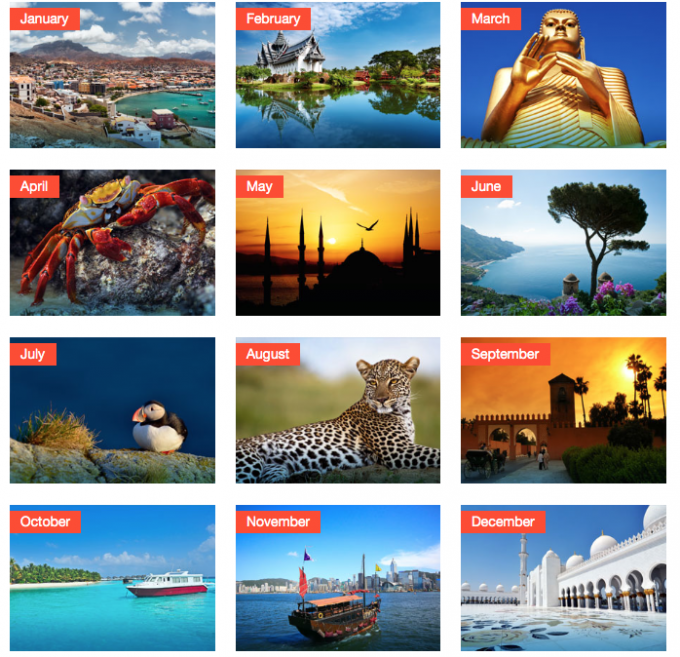 Where should you go to be guaranteed sunshine at different points in the year? So when Sunshine.co.uk got in touch and offered to share their top tips we couldn’t refuse, we’ve put together this handy guide in collaboration with them. The Sunshine story starts back in 2003, founder Chris worked on HolidayWatchdog.com – a site that lets people read impartial reviews of holidays and hotels across the world. A bit like Space in Your Case, he built it around a day job. The site got bigger and bigger, until they eventually sold it to TripAdvisor/Expedia. So they know a few things about holidays. Sunshine.co.uk aim to sell the amazing holidays as cheaply as possible – achieveable because they only sell online and because they rely on word of mouth rather than expensive advertising – perfect if you are looking for a thrifty holiday. So where can you get sunshine when? January – Cape Verde, off the African coast is accessible and warm with a 5-6 hour flight time, or Gran Canaria at only 4 hours flight time from London. January is out of hurricane season for Miami, and theme parks will be quieter. The Maldives will have the highest temperature and South Africa a whopping 11 hours of sunshine a day. February – Catch Mexico before it gets too humid, or check out Brazil at the height of Summer, with consistent 20 degree temperature. Thailand has 9 hours sunshine a day and February is the driest month, so sightseeing won’t be too arduous with kids. March – The Phillipines and Sri Lanka dodge the rain in March and April, while the Cayman Isles dodge the humidity and the rain and Jamaica is out of hurricane season. April – Hatching season for giant tortoises, green sea turtles and land iguanas on the Galapagos Islands, whose warm waters are inviting even in April. In Eygpt the heat will be more bearable in Sharm el Sheikh and the family friendly beach resort of Hurghada. Or sneak to Hawaii while it is warm, but before the hurricane season in June. May – Long sunny days are well established now in Tunisia, but a nice average of 22, makes the North Africa smaller person friendly. Crete, Sardinia and Tuscany are all family friendly locations, great to visit before the full summer heat sets in. June – Paris is driest in June and Portugal and Malta will be lovely and warm, but not too hot to sightsee. June is also a good time to get a bargain holiday in Aruba. July – Costa Brava in Spain offers a more comfortable Spainish heat now, with lowest chance of rain. The region has fast become one of the most visited and has become associated with high quality holidays. Alaska and Norway have their highest temperatures and in July Norway never goes dark. Now is the time to catch some incredible wildlife in both Alaska and Norway. August – Corfu, Tenerife and Bulagaria reach their hottest, alternatively now is a good time to catch wildebeest migration on a Kenyan safari, while it is dryer and a little cooler. September – Is great for the Med, take a cruise, check out Zante, although maybe not Ibiza with kids, as most the clubs hold their closing parties in September! Prague and Portugal will be cool enough for sightseeing, yet still sunny. October – Still 8 hours of sun in Mauritus, or fall in love with New England Autumn – something everyone should see, and it’s still warm too. November – Now is the perfect time to do Las Vegas, when it is 16-20 degrees, and cooler at night, not an unbearable 40! December – The Bahamas and Antigua have sunshine. For ski Sunshine suggest Bulgaria for value and guaranteed snow. We’re only sharing a few of Sunshine.co.uk’s top picks here, but to find more guaranteed sunshine destinations for each month, read more about each destination and to book your own bargain bit of sunshine, visit Sunshine.co.uk. Lots of great places! Interesting to see which places are best for school holiday times too.